Tumors that begin in brain tissue are known as primary tumors of the brain. When cancer spreads from its original place to another part of the body, the new tumor has the same kind of abnormal cells and the same name as the primary tumor. Cancer that spreads to the brain from another part of the body is different from a primary brain tumor. When cancer cells spread to the brain from another organ (such as the lung or breast), doctors may call the tumor in the brain a secondary tumor or metastatic tumor. Secondary tumors in the brain are far more common than primary brain tumors. . Primary brain tumors commonly seen are Menningioma, Astrocytoma, Gliomas, Schwannomas, Epidermoids, Dermoids, Tuberculomas, Abcesses. Third Ventricular Tumors like Colloid Cyst, Piheal Region Tumors. 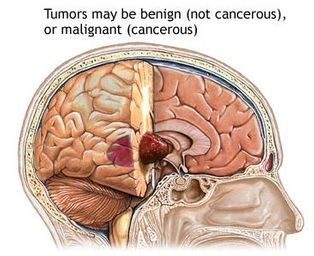 The symptoms of brain tumors depend on tumor size, type, and location. Symptoms may be caused when a tumor presses on a nerve or damages a certain area of the brain. They also may be caused when the brain swells or fluid builds up within the skull. 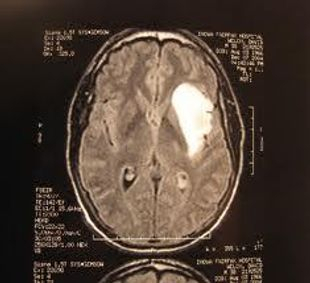 the most common symptoms of brain tumors: are Headache, Nausea or vomiting, Changes in speech, vision, or hearing, Problems balancing or walking, Changes in mood, personality, or ability to concentrate, Problems with memory, Muscle jerking or twitching, Numbness or tingling in the arms or legs, etc. Other conditions also could cause these problems. Anyone with these symptoms should see a doctor as soon as possible. Only a doctor can diagnose and treat the problem. Surgery is the usual treatment for most brain tumors. Surgery to open the skull is called a craniotomy. It is performed under general anesthesia or awake too. The surgeon then makes an incision in the scalp and uses a special type of saw to remove a piece of bone from the skull. This surgey for Tumor Excsion is done with the help of Microscope CUSA & the latest technique of Neuro Navigation which helps in removing these tumours completely without damaging to any other Neural structures around this tumours. Recently we are also using Intraoperative MRI to assess the extent of tumor removal. After removing part or the entire tumor, the surgeon covers the opening in the skull with that piece of bone or with a piece of metal or fabric. The surgeon then closes the incision in the scalp. During the whole surgery, all the modern Ventilators, Cardiac monitoring & very sophisticated tests are carried out & post operatively patients are monitored in ICU.